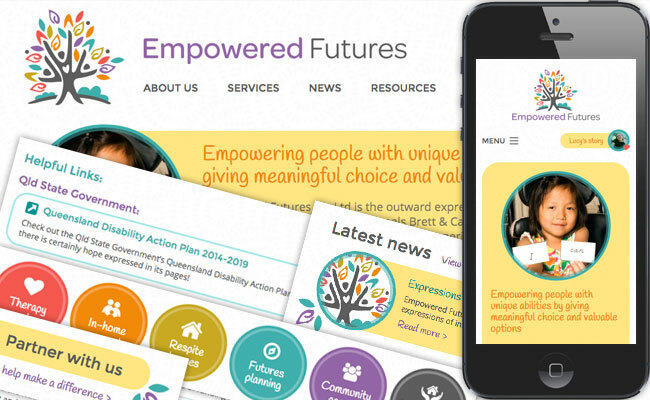 I’m happy to announce that the latest Equivalent Exchange built website, Empowered Futures, has been launched. Empowered Futures Pty Ltd is the outward expression of the internal passions of parents and professionals Brett & Carolyn Swann. Brett & Carolyn have combined their professional experience with their own personal journey of caring for their daughter Lucy to establish Queensland’s newest and one of its most exciting disability providers. It is our passion to challenge the way disability services are currently delivered. After working with Brett on the Enhanced Care website earlier this year, I was more than happy to work with he and Carolyn on their new venture. Being able to work on helpful, useful websites, for lovely people, is why I got into web development in the first place. Read all about the Empowered Futures project here, in its case study, and visit the website for yourself at empoweredfutures.com.au.